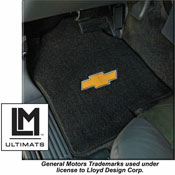 Ultimat Carpet Is A Multi-Layer Construction Designed Specifically For Automotive Use. • 5 Year Warranty! Premium nylon yarn provides excellent wear characteristics and durability. • Ultimat Carpet Layer (face): 2 pounds of premium nylon 2 ply continuous filament yarn in each square yard. Durability and density is created by twisting and heat-setting two pieces of yarn together in each woven tuft. • 4 layers of backing: Polypropylene mesh gives the tufted yarn its shape, extra heavy latex creates stiffness to help maintain mat shape, water-resistant layer to keep moisture from the original carpet, final Tractionbac composition rubber has natural non-skid characteristics. • Mats for vehicles without OE anchoring devices, are equipped with Lloyd’s proprietary anchoring system. • Over 6000 unique floor designs. • Cars, Trucks, Vans and SUV’s. • Many one-piece full width patterns for greater coverage. • Licensed Trademark embroidered designs for 17 automotive makes including: General Motors, Ford Motor Co., Chrysler, Dodge, Hummer, Jeep, Plymouth, and Porsche. • Over 750 embroidered emblems and designs. • Embroidered Appliqué: Pre-embroidered appliqué permanently welded deep into the carpet face using RF Technology. • Optional marine grade vinyl binding materials. • Five year warranty against defects in design, workmanship and materials.